Merry Christmas everyone! For folks who have been following this Advent blog, you know that today is the day we have been waiting for. Waiting quite literally, as Advent is a season of waiting for the miracle that is on its way to us (remember that it is from the Latin adventus, and means “coming”)? For those of you who landed here in search of our annual family holiday letter, welcome! You’re in the right place, and I’m so glad you’re here! Please read along (and maybe even visit some of the previous posts)! Everyone will also find some Srajek family 2010 moments over at: www.srajek.wordpress.com. The title of today’s post comes from a quotation by Theodore Roethke: “Deep in their roots, all flowers keep the light.” Advent is called “the season of light,” and writing this blog [one post and one poem (not by me!) 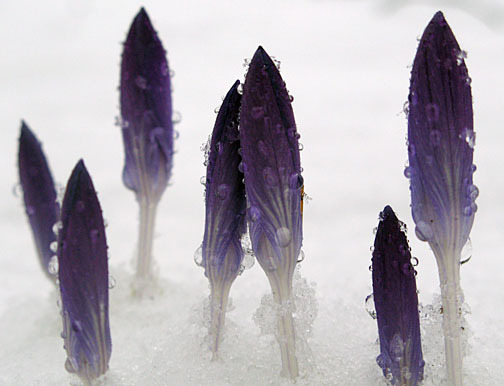 for each day of Advent] has, from the beginning, been a way to draw attention away from the typical experience of winter darkness, and towards the light, whatever form that light may take. The promise of Advent, the one God makes good on on Christmas day is this: “to give light to those who live in darkness and the shadow dark as death, and to guide our feet into the way of peace” (Luke 1:79). I have been continually amazed these last four weeks, as I’ve been writing and reflecting, and as some of you have written in to share your experiences, at the tug of war between dark and light, hope and despair, homelessness and belonging, and just a general sense of not-okayness vs. feeling okay in the world. And isn’t this just the simple truth about what it means to be human? We are always somewhere on the spectrum of that struggle, or if “struggle” is too negative a word, that simple state of being. No one place is better than another (though some are infinitely more comfortable than others), and no one place is more “right” than another. Anywhere we are, between the darkness and the light, between sickness and health, fear and love, is where we are, and that’s just how it is. But we’ve also found that there are reminders of protection, belonging, reassurance and love everywhere we look. And even more than that, that darkness, in whatever form it takes, has meaning, not necessarily, or not just for us as individuals, but for others as well. All of our experiences mean something, not to us alone, but to us as a human among humans. The line in the Oswald Chambers quote: “When you are in the dark, listen, and God will give you a very personal message for someone else when you get into the light,” has often struck me as just weird, because when I’m in the dark, I’m looking for the way out for me. I’m not particularly interested in other people. Maybe we would feel more real, but what I hope we feel is that we can matter, we always matter, even, perhaps especially, when we are just ourselves, regardless of the state we are in. We all belong. We are never alone. And whatever we bring to the table is welcome. My absolute favorite passage of the Christmas story is this one from Luke: “An angel of the Lord stood over them and the glory of the Lord shone round them. They were terrified, but the angel said, ‘Do not be afraid. 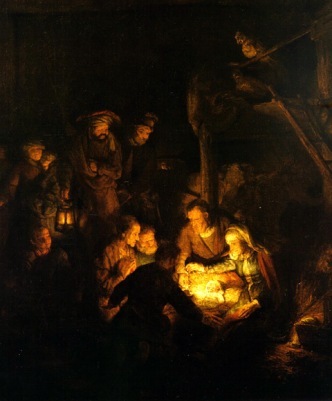 Look, I bring you news of great joy, a joy to be shared by the whole people” (Luke 2:9-10). That’s the promise that’s fulfilled today. I grew up as a Catholic, complete with 12 years of Catholic school. And, like my son Noah, came out the other side feeling distinctly non-spiritual. This changed over the years, though I have struggled with the use of “churchy language” in my writing. But writing this Advent blog, and knowing that you were there, on your side of the screen, reading along, has taken that passage above and lifted it out of being just a Bible story, spread it wide open like the enormous wings of the angel, and let it protect and encompass all of my human experience, all of our human experience. This is what I hope to share with you at this moment, and what I hope we have shared as we’ve been waiting together. Merry Christmas, Happy Holidays, the warmest wishes, and more love and gratitude than I can possibly express. Blessings, blessings, blessings. Come on back, and if you’re here for the first time and want to join in, just click on the gray “sign me up!” box on the top right. It would truly be an honor to have you here. The tradition is to end each post with a poem. This one that I’m going to leave you with today is sneaky, tricky, crafty. One might even say subversive. On top of that, it’s by a 10th century Christian mystic. Be warned–it does a lot more than you think it’s doing. But trust me; give it a try. It’s worth it. my foot, and is infinitely me. whole, seamless in His Godhood). I am most grateful for the sharing of your thoughts and feelings this advent season. All so well written. Thank you, Linda! I’m so glad you were here! Happy New Year to you and your family. Merry Christmas to you, Leslie and your family of Martin, Noah, Jacob and Gabriel. Blessings continue. I am working Christmas Day as security/receptionist at a front desk in a lovely place for wealthy retired people. I have wored here part time for 8 yeas! It is a delightful place called the Arium at the Cedars. It is quiet, all residents are thus far calm and healthy and may they be so throughout this day. But whatever. Thank you for sharing this story. I love imagining you with your beautiful, giving spirit out there in the world touching people. I’m honored that you are also here. Thank you! All my love and good wishes for a happy, happy 2011. Thank you, Janet! I’m so glad you enjoyed the poem. I love it too.